Property 20: IN TOWN! LARGE TERRACES & VIEWS of Vineyards & Olive Groves - Walk to Center! Property 29: Charming And Well Decorated Apartment In The Centre Of The Town, Amazing View ! 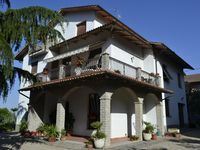 Property 33: Very cute apartment in the core of Montepulciano and at the feet of the main sq. Very nice apartment, easy access to everything needed. Deborah's mother lovely person to talk to.